Remember Gumby? That odd-looking animated clay figure that resembled a pencil eraser (and became the template for thousands of erasers and key-chains fobs). Animator and producer Art Clokey created Gumby in the mid-1950s and soon after the clayboy received his very own Saturday morning TV series. “The Gumby Show” debuted on March 16, 1957 on NBC. Since then, Gumby has gone on to star in 223 TV episodes produced in the 50s, 60s and 80s, along with one feature film made in the 90s. 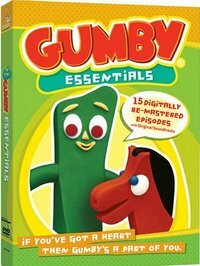 To celebrate Gumby’s Golden anniversary, Genius Products and Classic Media have released “Gumby Essentials,” a DVD collection that includes popular episodes from the series, personally selected by Clokey. “Gumby Essentials” sells for $16.93 and features environmentally friendly packaging. Bonus features on the DVD include Clokey’s Original 1953 theatrical short “Gumbasia,” the pilot episode “Gumby on the Moon,” the 1960s Gumby theme song and introduction, rare Gumby “bumpers” and character bios. Art Clokey’s son has used the original film stock to digitally remaster each episode; the original soundtrack has been restored and the 50s episodes returned to their original 11-minute format (previously two re-edited, 6-minute shorts). 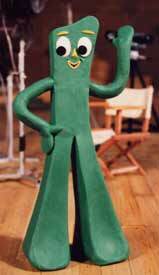 I have been searching for a clay/rubber Gumby figurine for a long time now…we just dont have anything Gumby here in NZ! Can anybody please help me?? Does anyone know where I can find one? Or can I buy one off someone here? ANYTHING PLEASE! to watch out for brussels. I will be grateful if you cotinue this in future. Many people will be benefityed from you writing. Cheers!